How Safe Is Indian Army's Firepower? What: An explosion at the Army's Central Ammunition Depot (CAD), Pulgaon (over 90 km from Nagpur) left six persons dead. They were engaged in destroying anti-aircraft ammunition rounds. India has 39 ordnance depots which includes one central ammunition depot, 7 central ordnance depots, 4 central vehicle depots, 13 regional ordnance depots and 14 regional ammunition depots. Big Deal: The Pulgaon depot houses the biggest stockpile of weapons, explosives and ammunition (it's one of the biggest in Asia) and feeds the entire Army. Most of the ammunition used by the Indian Army is manufactured at one of the 41 ordnance factories across the country and brought to this 'mother depot' before being sent to smaller forward depots. The depot stores all kinds of ammunition from BrahMos missiles to rifle bullets. 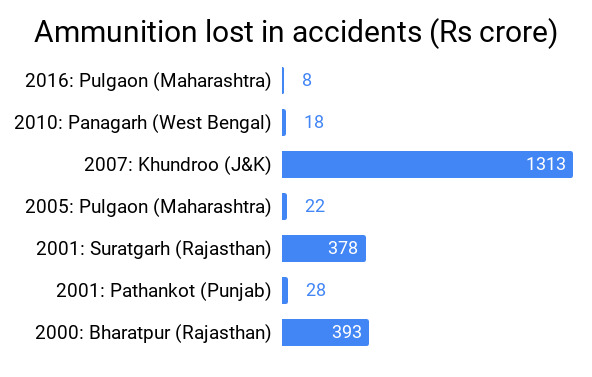 Where: India has lost hundreds of crores worth of ammunition and scores of lives in accidents at ammunition depots. This is the fourth accident at the Pulgaon depot since 2005. Two years ago a much bigger blast had killed 19 people and injured 17. Government had later given a special waiver to classify these deaths as battle casualties so that families of the defence personnel killed get higher pension benefits (deaths were earlier classified as physical casualties due to military service). Among the biggest ones are the following. Why: Most accidents have occurred either due to lack of facilities, lax maintenance or not following standard operating procedures. For example, in 2016 government said that ammunition depots were short of 23 fire-fighting trucks and 362 personnel. In case of the Pulgaon blast, some reports say that contract workers were employed by ordnance factory along with its own staff during disposal of ammunition.